You’re enjoyment for Killing Hasselhoff depends on a couple things: one is if you have any interest in “The Hoff” (which I don’t) or like Ken Jeong’s style of humor (again, which I don’t), thus this was a tough sit through as most of the humor didn’t really land very well. What started out as a regular week quickly turns into the worst few days of his life when Chris (KEN JEONG), a struggling nightclub owner, fails to pay back a loan shark and decides the only way to get the money is to kill his pick in the annual “Who Will Die This Year” celebrity death pool: David Hasselhoff. Aided by his friends Fish (RHYS DARBY) and Tommy (JIM JEFFERIES), Chris desperately tries everything he can to off the master of slow-motion running and claim the jackpot. But the task is not as easy as he thought, especially when your target is The Hoff! Only feature included are some “hilarious” Deleted Scenes (8:27). The film is presented with a 16×9 enhanced 1.85 widescreen transfer providing for some bright colors of a scenic Los Angeles skyline and the audio given is an adequately standard Dolby Digital 5.1 track. English SDH, Cantonese, Complex Mandarin, French European and Thai subtitles included. 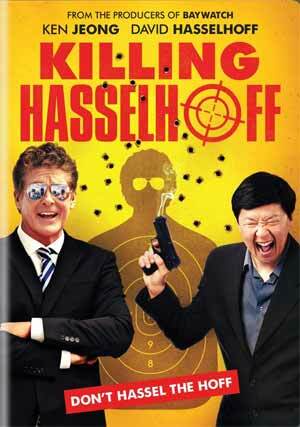 Overall, you’re enjoyment for Killing Hasselhoff depends on a couple things: one is if you have any interest in “The Hoff” (which I don’t) or like Ken Jeong’s style of humor (again, which I don’t), thus this was a tough sit through as most of the humor didn’t really land very well. The DVD included is basic with okay video and audio transfers and a throwaway selection of deleted scenes.